A bear named by a little Donegal boy is aiming to reach over €4 million raised in 4 years for the little heroes of Temple Street Children’s Hospital. Due ,to popular demand Cedric teddy bears will be available in Tesco stores nationwide from today (Sat) for €5 in aid of Temple Street Children’s University Hospital. The good news is that Tesco customers and colleagues can now get their very own Cedric from Saturday 1st December, while stocks last. Each Cedric purchased will help Tesco reach their target of raising €4million in 4 years for the children’s hospital. 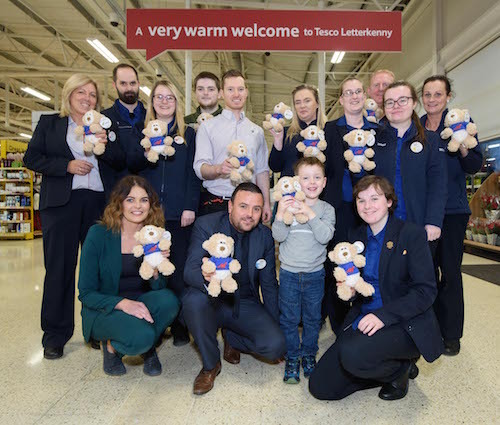 Pictured alongside colleagues from Tesco Letterkeny is Temple Street patient Lewis Evans (5) from Letterkenny with the Cedric teddy bear that he named following a Tesco colouring competition during a visit to the hospital. Cedric teddy bears will be sale in Tesco stores for €5 in aid of Temple Street from Saturday 1st December. Front from left Nuala McIntyre, Gavin McMonigle, Lewis Evans and Jessica Harkin. Cedric was brought to life with the help of five-year-old Temple Street patient Lewis Evans from Co. Donegal, who participated in a Tesco colouring competition during a visit to the hospital and won the honour of naming this very special bear. Speaking on behalf of Tesco Ireland, Marketing Director, Ruairí Twomey said “At Tesco, we receive thousands of amazing comments from customers about the everyday little helps and great service they receive from our colleagues. ‘It was one of these fantastic stories about a colleague who went above and beyond to ensure a teddy bear was returned home safely that inspired our latest TV advert and the creation of Cedric. 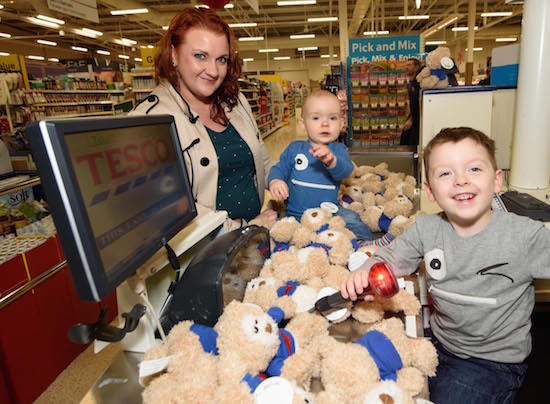 This weekend, Tesco stores across the country will be hosting Festive Fun Days over the weekend of Saturday 1st and Sunday 2nd December, selling Cedric teddy bears, hosting cake sales, offering face painting and much more all in aid of Temple Street. Speaking on behalf of Temple Street Foundation, Chief Executive, Denise Fitzgerald, added: “The festive season has now well and truly arrived at the hospital thanks to the team of Tesco elves who delivered the wonderful Cedric this week. Our partnership with Tesco continues to have a transformative impact on sick children and their families every minute of every day. Since 2014, with the support of its colleagues and customers Tesco Ireland has raised €3.9 million for Temple Street. By selling Cedric in stores and hosting these Festive Fun Days, Tesco is aiming to reach over €4 million raised in 4 years for the little heroes of Temple Street.